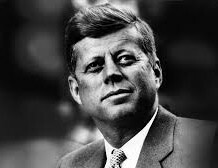 Fifty years after John F. Kennedy’s shocking and saddening death, our country is wrapped up in an era marked by political division, partisan bickering and cynicism. But attorney and author Scott Reich believes that Kennedy’s inspirational and timeless message of public service and active citizenship–values that The Common Good so proudly promotes–has a new resonance today. Kennedy made public service aspirational – even glamorous – as the nation’s “best and brightest” answered the President’s call to serve in his administration, the Peace Corps or other types of public service. Have the intervening decades of talk depicting government as flawed, bloated, and often at odds with personal freedoms, blunted the inspirational Kennedy message of service to country? Join us on the evening of Tuesday, December 3 as we discuss the Kennedy legacy with Scott Reich, author of “Power of Citizenship: Why John F. Kennedy Matters to a New Generation.” Just following the somber anniversary of Kennedy’s assassination, it is more than fitting to reflect now on how we as a country can work to promote Kennedy’s vision.